Takes familiar features of the world we know and shows how they can be used to explain profound truths about the ultimate nature of reality. The winner: Life Ascending by Nick Lane. 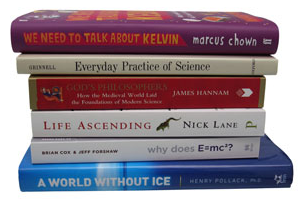 As an aside, I will soon be receiving all six of these books compliments of New Scientist. I won a contest in which readers were asked to name the most underrated science book written for a general audience. My pick of K. Eric Drexler's Engines of Creation was my choice.